Following a 1,600-calorie diet plan will likely help you shed pounds at a slow, steady pace of about one pound weekly (especially for men and active women), says the National Heart, Lung, and Blood Institute. Limiting carbs makes it easier to control blood sugar and cut calories, especially when eating lots of satiating protein-rich foods. Click to download the diet plan. 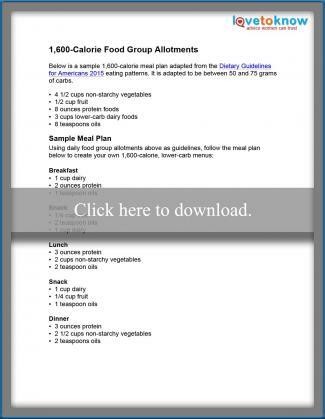 Below is a sample 1,600-calorie meal plan adapted from the Dietary Guidelines for Americans 2015 eating patterns. It is adapted to be between 50 and 75 grams of carbs. Below are foods you can pick (from each food group) to create low-carb menus based on the sample 1,600-calorie meal plan above. 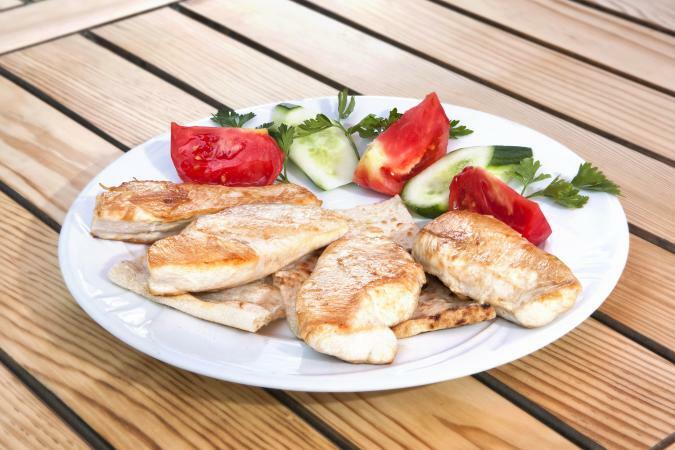 Use your sample meal plan to create your own 1,600-calorie, low-carb diet menus. The following sample menus were created using the meal plan above, and the U.S. Department of Agriculture's Food Tracker. Dinner: One 3-ounce turkey burger patty, and 1 cup of sliced cucumbers mixed with 1 cup of cherry tomatoes topped with 2 tablespoons of balsamic vinaigrette. Lowering your carb intake is an excellent way to shed pounds and help regulate blood sugar. You'll reap the benefits of a well-balanced diet (with the exception of grains) and slowly lose weight at a healthy pace. Some older adults can maintain healthy weights eating just 1,600 calories per day.